1.Place steaks in large zip-top plastic bag; pour 1/2 cup dressing over steaks. Seal bag, pressing out any excess air; refrigerate at least 1 hour or up to 8 hours. 2.Soak skewers in water 30 minutes. Heat large saucepot of salted water to a boil over high heat; add potatoes and cook 10 minutes. Drain and let cool; cut potatoes into quarters. 3.Prepare outdoor grill for direct grilling over medium-high heat. In large bowl, toss potatoes with oil; thread onto skewers. Place skewers on hot grill rack; cover and cook 10 minutes or until potatoes are crisp, turning once; let cool. 5.Remove potatoes from skewers. In large bowl, toss eggs, tomato, radishes, onion, basil, salt, pepper, remaining 1/4 cup dressing and potatoes until combined; fold in arugula and cheese. 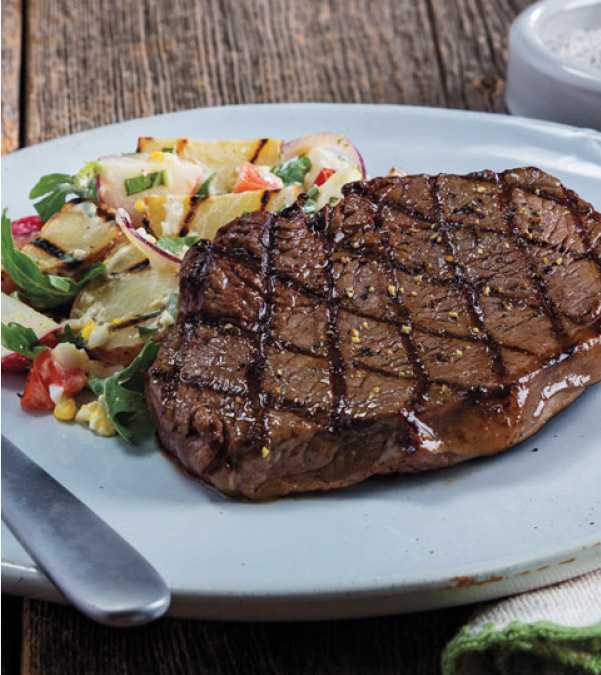 Serve steaks with potato salad.